Games seek to provide immersive experiences in a variety of ways. Sometimes, we look to a game's artistic aesthetics to convey the existence of its virtual space. Unfortunately the passage of time and the technological improvement that comes with it can serve to retroactively detract from games that rely largely on imagery to captivate the player. For example: Jorge and I have been playing Halo 1, and while features such as its textures or facial animation may have been impressive in its time, new styles and techniques have supplanted them, and they now serve the opposite purpose for which they were designed. A narrative approach to immersion sidesteps some of the problems of relying on sight and sound to create a world. A compelling story may help a gamer invest themselves into a game world. Whether such a story is formed by a strong authorial hand or by a game world that acts as a medium for individually tailored experiences, story-making can imbue deep meaning into the most banal sprites. My preferred route to immersion is a physical one. The sole tangible connection between a player and their game is through their control setup. To this end, I think that haptic technology is often overlooked in terms of its potential for immersive impact. That's right: I love force feedback in games, and not for the lascivious reasons you may assume. In order to explain this, let me share some of my favorite instances of force feedback. Historically, Nintendo has been at the forefront of console control innovations, and force feedback is no exception. In 1997, the release of Star Fox 64 and the introduction of the Rumble Pak ushered in the age of vibrating controllers. As is to be expected, the Star Fox utilizes vibration to augment the many large explosions created by its team of woodland aviators. However, the game also contains a number of nuanced uses of vibration designed to subtly immerse the player. Firing a charged laser shot yields a short, dull thud as the beam leaves your weapon. When the Arwing's wings shift for different types of flight, a sustained rhythmic pulse, accompanies the movement of the airfoils' flaps. Using the break would elicit a different rumbling frequency than using the boost. Star Fox 64 is impressive not only because it normalized force feedback in video games, but also that it did so creatively. In addition to crowd-pleasing explosions, vibration was used to convey both the extraordinary and mundane sensations of piloting anArwing. Whether it is breaking the fourth wall or allowing the player to feel the heartbeat of digital characters, the entire Metal Gear Solid series is a testament to the inventive use of force feedback. Sometimes, it would take the form of Kojima experimenting with the boundaries of the medium. In the famous Psycho Mantis telekinesis scene, the player a fun taste of the insane world Snake inhabits in return for a suspension of disbelief. The series also uses vibration to augment gameplay events. Every time Snake is spotted, a sharp jolt accompanies an audio and visual cue, adding to the sudden chaos of the situation. Tools such as the heartbeat monitor allow the player to track enemies using the pulse of their controller. The transition into a 3D allowed players to experience a more detailed Hyrule. In addition to the visual spectacle, Rumble Pak support afforded players a new sense of what the Zelda universe feels like. Like Star Fox, Zelda uses vibration for both obvious and subtle purposes. Vibration is used to heighten the sense of danger when doing battle, but Link has hobbies outside of fighting demons. Whether he is playing with explosives, practicing his equestrian skills, or lazing the day away down at the fishing hole, his activites are conveyed to the player through feel. 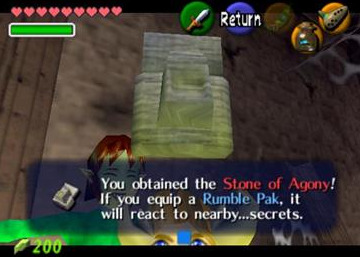 In what should be seen as both a wink at the player and a clever way of selling more Rumble Paks, the N64 Zeldas included an item called "The Stone of Agony." After obtaining it, secret underground caves would cause the controller to vibrate. The item functioned as a haptic metal detector, vibrating stronger and more frequently as the player got closer to the invisible entrance. I became aware of force feedback's impact on my immersion while replaying Majora's Mask on the Wii Virtual console. Disappointingly, the port does not support force feedback, rendering the Stone of Agony useless. However, it was not just the absence of this item: it was as if the game had lost a certain heft that made it somehow more authentic. When I stuck my sword against a wall, there was a clang, but no vibration. The world felt hollow, and all because of the absence of a tiny motor. Although this post might make it seem like I am stuck in the 1990s, my next post will focus on more contemporary uses of force feedback, as well as my hopes for the future. Until then, feel free to jump in to the comments with your favorite uses of video game vibration. How important is force feedback to your gaming experience? Which games rocked your world with rumble? Do you view it as a gimmick, or is your faith in its immersive qualities unshaken? I feel when it comes to rumble, less is more. The best uses of rumble are the ones that don't make my hands feel funny. But the slight rumbles that hit you for minor events cause more immersion than if the dualshock rumbled during every machine gun blast. You mention Star Fox 64 where its used during the charge blast, rather than every single shot. It makes more sense and doesn't overload your touch senses. A definate idea of quality of the use rather than the quantaty. As the Game Critique was saying though, overused it's barrier to immmersion, such as in the boss fights in FFX where the controller will rumble for about 45 seconds at max every time the boss uses his ultimate attack, which occurs three times ;__;. I had to put my controller down, the game making me physically sperate myself from the primary point of immersion, my agency in the game. Can't wait till the follow up, as a long time PC gamer this is an aspect of immersion which has long gone over my head. I tend to dislike force feedback as too tacky. Some of the examples you and others mentioned seem cool in theory, but when my controller starts rumbling I become keenly aware of my hands. The early implementations were particularly distracting, they always seemed to rumble hard. Gentler movement in modern controls are an improvement, so maybe rumble is giving me more enjoyment than I realize. "As the Game Critique was saying though, overused it's barrier to immersion, such as in the boss fights in FFX where the controller will rumble for about 45 seconds at max every time the boss uses his ultimate attack, which occurs three times." FFX was a prime offender in the misuse of rumble. Every summon, I'd put down the controller and wait for the animation and rumbling to end. 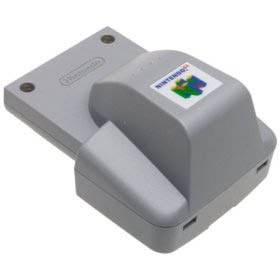 Perhaps the fact that the Rumble Pak wasn't self powered encouraged Nintendo to use it judiciously. I can't even imagine how many batteries I must have gone through! Have you ever used any force-feedback controllers for your PC? They aren't as standardized as console controllers, but I know there are some premium racing wheels. Also, the Novint Falcon looks awesome. I'll probably include it in my next post. This is where I think force feedback shines: instead of cluttering up the screen with a "heart beat" menu, its piped through the controller. Immersive and visually economical! Have there been any games in which you consciously appreciated force feedback? Sounds like FFX was a bit too eager to shake things up. I didn't notice the over-done vibration, but that's probably because I was too distracted by the horrible voicework. Zing! You could try to have a talk with Squenix, but I'd imagine there would be a lot of indirect references, staring off into the distance and conspicuously drawn-out pauses. I'd call them pregnant pauses, but I imagine it'd be more like "hilariously devoid of meaning or intention." I'm sort of picturing it like an awkward moment in one of NBC's current comedies.